If you’re looking for an ultra feminine luxury dress watch, then a solid yellow gold Rolex Lady President timepiece always fits the bill. Sized at a demure 26mm, the Lady Datejust President ref. 6917 is everything a chic lady needs in her watch wardrobe. The 18k yellow gold Oyster case is topped with the characteristic fluted bezel and presented on the iconic President bracelet — distinguished by its rounded three-link construction and synonymous with prestige and excellence. 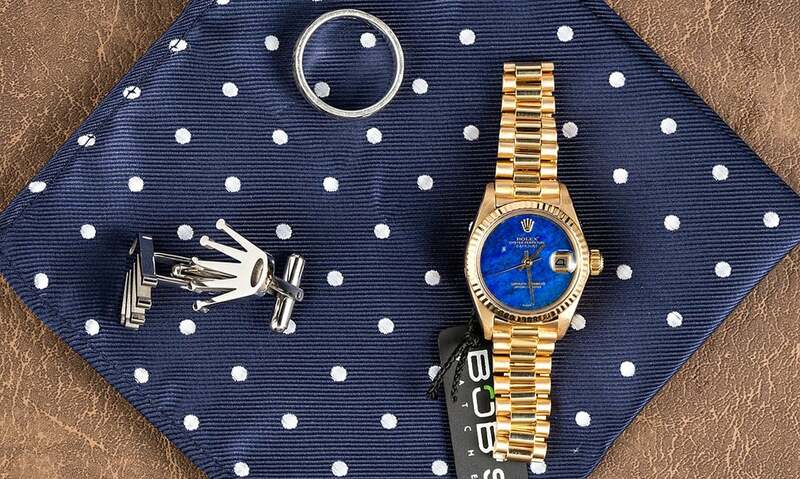 But, if you’re after something even more special, finish it off with a bright blue lapis lazuli dial and now you’ve got a ladies Rolex that’s unforgettable. The real show stopper is the mesmerizing lapis lazuli dial prized for its rich blue hue. 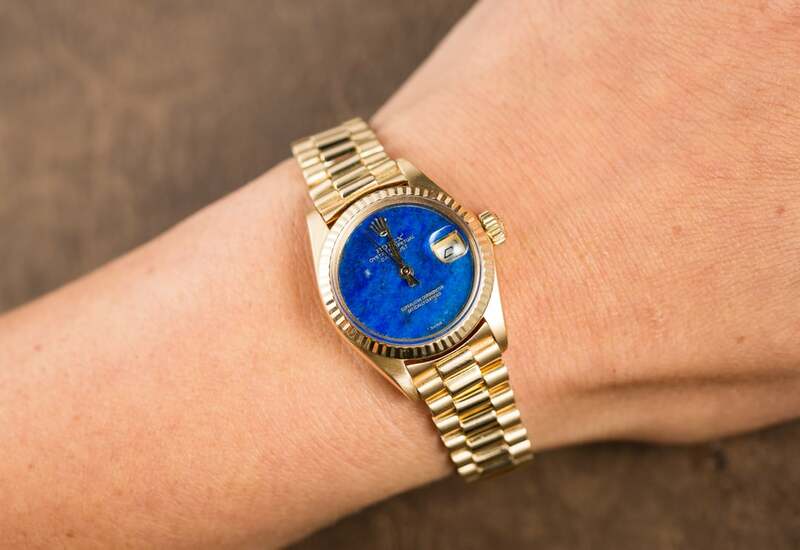 Speckled with gold accents, the blue colored face of the lapis lazuli dial is especially complementary to the 18k yellow gold case and bracelet. Furthermore, staring into the dial, the gold flecks and wisps of white amidst the blue shades lends a celestial allure to the face the watch. 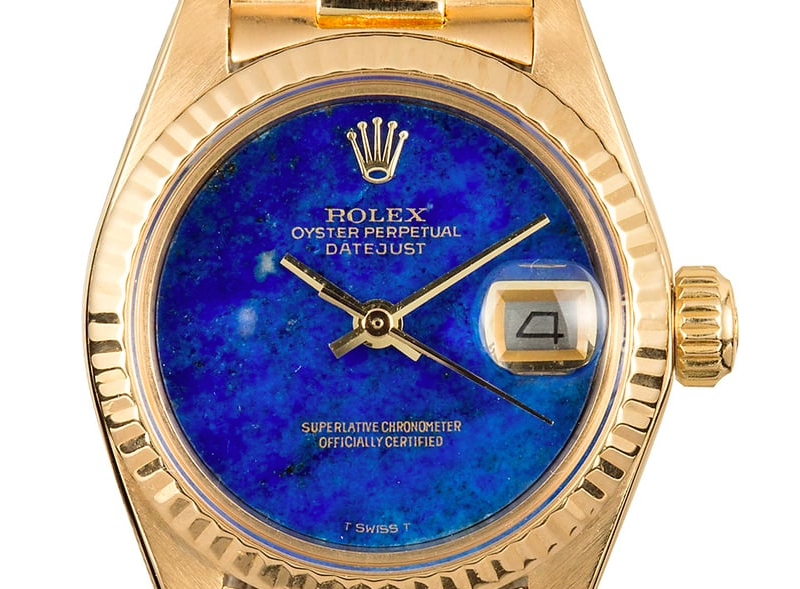 Since the dial is absent of any hour markers, the textured material of the semi-precious stone really shines through. Also, it’s the ideal backdrop for the gold center hands, gold text, and gold Rolex coronet to pop. Because the Lady Datejust ref. 6917 is part of the flagship Rolex Datejust collection, it features the standard date window at 3 o’clock with the accompanying Cyclops lens on the sapphire crystal. Beating at the heart of the Rolex ref. 6917 is the proprietary Caliber 2035 driving the three center hands and date function. The automatic mechanical movement is, as with all modern Rolex watches, a Superlative Chronometer Officially Certified. As a result, along with being certified by COSC (Official Swiss Chronometer Testing Institute), the ref. 6917 has also passed a battery of stringent in-house testing by the famed Swiss watch brand. Thus, the Lady President hosts a mechanical marvel within to match its outer splendor. The self-winding movement may be housed within a super classy exterior, yet it is far from delicate. Due to the Twinlock winding crown and airtight caseback, the Lady-Datejust’s waterproofness reaches 330 feet (100 meters). Due to its robustness, precision, and reliability, the ref. 6917 lives up to the Rolex reputation as an exceptional timekeeping instrument. 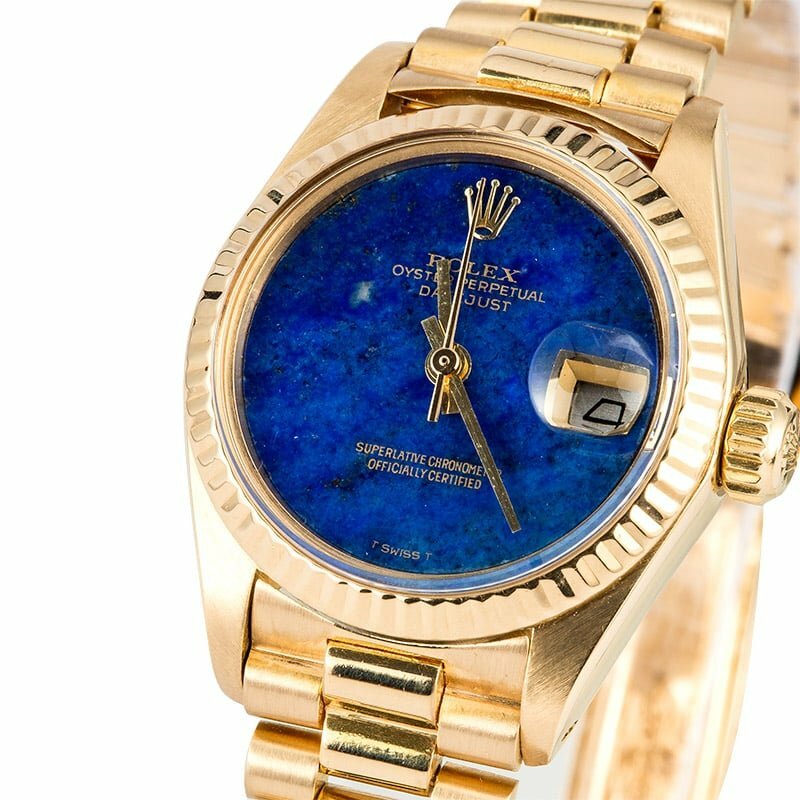 A vintage beauty, the Rolex Datejust President ref. 6917 with a lapis lazuli is sophisticated enough for everyday wear, yet precious and timeless enough to keep for a lifetime. A Rolex lady’s dress watch that’s distinct enough to keep you looking, even when you don’t need to know the time.